Greetings, and welcome to Day #7 of Chocolate and Peppermint Theme Week. How does one explain Peeps marshmallow candy? Have you ever watched someone become magically transformed by a happy childhood food memory? A fleeting expression of joy and wonder may cross their face, and the cares of their adult world seem to temporarily melt away. I've witnessed some of the staunchest fine chocolate experts go giddy over a childhood confection, that wouldn't have been given a second glance if first encountered later in adulthood. This explains part of the lasting popularity of Peeps and certain chocolate candies. Marshmallow Peeps from Just Born, Inc.* (Bethlehem, PA) are slightly amorphous (usually bird- or animal-shaped) marshmallows, often glued together at the hip in a row. They're tied to Easter basket candy and other fond and playful childhood memories for many who grew up in the U.S. The chocolate tasted quite real (it contained both chocolate liquor and real cocoa butter). 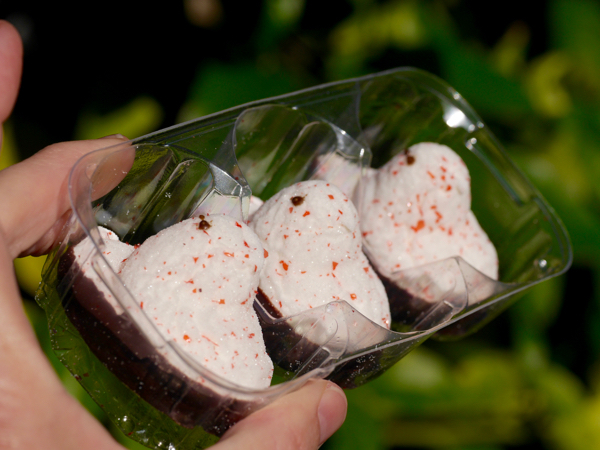 Oh, and (artificial flavor and red color not withstanding) did I mention these were gluten free? Today's Candy Cane with Chocolate Peeps were surprisingly good. 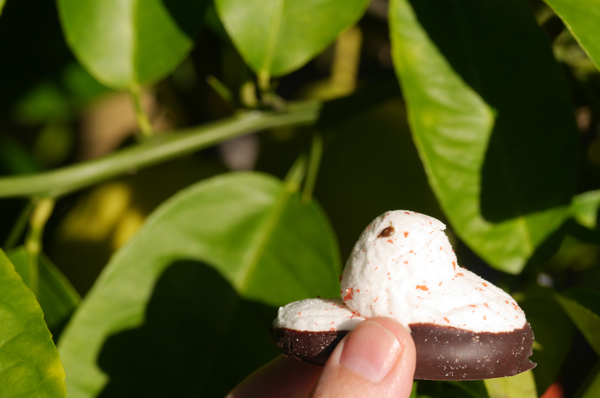 They were refreshingly peppermint flavored, sweet marshmallows sitting in their own dark chocolate base (or nest perhaps). You won't find these new born chicks outside in the grass and bushes (like I first did on Easter Egg hunts), but they're still fun all the same. 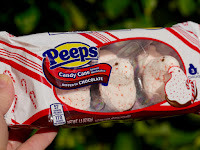 *Just Born, a third-generation, family-run candy company (that has an interesting history of its own, dating back to 1910 with Sam Born), acquired the Peeps brand and original marshmallow chick product line when they bought Rodda Candy Company in 1953.